No trip to China is complete without a cruise on the world-famous, spellbinding Yangtze River. Onboard one of the prestigious five-star cruise ships in China, the "East King" and the "East Queen" through the spectacular Three Gorges between Yichang and Chongqing, our river trips promise unparalleled adventure, combining unabashed luxury with majestic scenery and fascinating cultural attractions. Most of our cruises originate and/or end in the cities of Chongqing and Yichang. Nicknamed the "Capital of Mist" and skirted on three sides by rivers, the 2000-year-old city of Chongqing is famous for its rich historical and cultural legacies with famous sites such as Dazu Grottos, Hot Spring Park and Chongqing Museum. It is also fast becoming a city of the future, ambitious to be a powerhouse of industry and commerce. Yichang, the upriver gateway to the Three Gorges, has been a strategic water passage between Sichuan and Hubei provinces since ancient times. Today it is a new industrial city and the largest hydropower base in China. 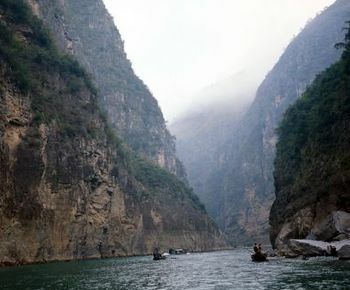 The Three Gorges Project site lies within its territory. Equipped with the finest navigational equipment available and specially designed to American specifications for the utmost in comfort and safety, the "East King" and the "East Queen", similar in comfort and luxury, offer the largest passenger cabins available on the Yangtze River. They are perfectly suited to meet the needs of individual or group travelers. Special events, including theme parties and business conventions, are professionally and efficiently managed by our western-trained on-board staff of tour specialists, from concept to completion. Both ships offer excellent recreational and leisure facilities to insure your utmost enjoyment while on board. Day 1: Departure - Depart the United States on your international flight to Beijing. Day 2: Arrive in Beijing, meet the guide and transfer to 4* Hotel. Day 3: Full day tour to Tiananmen Square, Forbidden City, Summer Palace. Includes: (B), (L), (D). Day 4: Full day tour to Great Wall, Ming Tombs. Enjoy Peking Duck Dinner at Quanjude Restaurant. Includes: (B), (L), (D). Day 5: Transfer to airport for flight to Xi’an. Arrive in Xi’an, meet the guide and transfer to 4* hotel. Afternoon visit Ancient City Wall, Wild Goose Pagoda. Includes: (B), (L), (D). Day 6: Full day excursion to Terra Cotta Warriors, Provincial History Museum. Enjoy Dumpling dinner and Tang Dynasty Show at Shange. Includes: (B), (L), (D). Day 7: Transfer to airport for flight to Chongqing. Arrive in Chongqing, meet the guide and tour to City Museum, TE-Ling Park, transfer to 5* East King/Queen Cruise after dinner. Includes: (B), (L), (D). Day 8: Cruise - 08:00-10:00, Shibaozhai - Shore Excursion. Includes: (B), (L), (D). Day 9: Cruise - 06:40-07:00, Passing Qutang Gorge. 18:30, Passing Three Gorges Dam 5-stage shiplocks. Includes: (B), (L), (D). Day 10: 08:30 -10:00, Three Gorges Dam Project – Shore Excursion. 11:30, Arrive in Yichange – Disembarkation. Meet the guide and transfer to airport for flight to Shanghai. Arrive in Shanghai, meet the guide and transfer to 4* Hotel. Includes: (B), (L), (D). Day 11: Full day tour to Yu Garden, Chenghuangmiao – old quarter of Shanghai, Shanghai Museum, and the Bund. Includes: (B), (L), (D). Day 12: Exit Transfer to airport for exit flight to the United States. Includes: (B).